Shaheen Dill-Riaz receives the GROSSE KLAPPE film award at the doxs! film festival in Duisburg, November 9, 2012. Photo: doxs! Filmmaker and director Shaheen Dill-Riaz has added another prize to his growing list of film awards. The jury at the doxs! festival in Duisburg, Germany presented Dill-Riaz with the GROSSE KLAPPE film prize for The Projectionist. 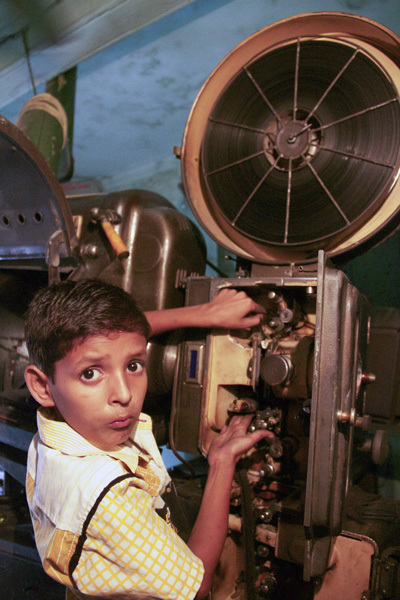 His film, which premiered in October, chronicles the life of Rakib, a ten-year-old boy who grows up working as a projectionist at a cinema in Bangladesh. The sights and sounds of the old movie theater in his neighborhood had always fascinated Rakib. But what drew him into the theater after school weren’t the dazzling veneer or the movies that flickered on the screen. It was the ancient 35 mm film projector in the back room that interested him most. Step by step, Rakib learned how to operate the intricate machine, which is easily twice his size. And what had started out as an exciting game soon turned into a regular job that presented Raqik with a lot of challenges and a few moments of joy. In Dakha, the teeming metropolis that is the capital of Bangladesh, child labor isn’t uncommon, and Rakib is part of this wide-spread phenomenon. But one thing sets him apart from the downtrodden shoe-shine boys or Riksha cabbies that populate the streets of Dakha. It’s the gleam that flickers across his eyes when he operates his projector. It betrays a sense of pride and passion for film that is rarely found in children his age. And passion for film is all The Projectionist is about. Shaheen Dill-Riaz has a penchant for stories about childhoods spent a less-ordinary way. He has focused on the coming-of-age theme in The Networker (2011) and most memorably in Korankinder (2009). In each of those films, Dill-Riaz draws on memories of his own childhood, which he spent at a military academy in Bangladesh. Those memories always lurk in the background, as Dill-Riaz readily acknowledges, and inspire him to see how other childhoods are spent, wondering if some of those could have been his. His latest documentary, The Projectionist is no exception. The protagonist Rakib is torn between the responsibility as his family’s sole breadwinner and his life as a regular school boy. Dill-Riaz masterfully captures this conflict, as some of the films strongest scenes reveal, such as in Rakib’s interaction with his mother. In those moments, one can almost feel how Rakib is clinging to a childhood that is slipping away too fast. The Projectionist was met with much critical acclaim when it celebrated its première at the 46. Hof International film Festival at the end of October, together with Dill-Riaz film Side by Side. Shaheen Dill-Riaz doesn’t come across as someone who cares too much about his own status or the awards his films win. His modesty is something that is hard to miss for anyone who has ever sat with him face to face. But the GROSSE KLAPPE film prize is somewhat of an exception for Dill-Riaz. It specifically recognizes documentaries that focus on sociopolitical stories and issues that affect children and adolescents, Those topics have become somewhat of a hallmark of Dill-Riaz’ films, as he has repeatedly shown in his works. The day after receiving his award, Shaheen Dill-Riaz was already on his way to the airport. His destination? Dakha, Bangladesh, where he is currently working on his next project. Passion for film is his driving force, and Shaheen Dill-Riaz is living up to this motto.